Corrosion control and prevention is a growing aspect of the oil industry. Corrosion-the deterioration of a metal or its properties-attacks every component at every stage in the life of every oil and gas field. From casing strings to production platforms, from drilling through to abandonment, corrosion is an adversary worthy of all the high technology and research industry can throw at it. Drillpipe corrosion for example is probably the most harshly treated of all equipment. Joints of drillpipe are made from hardened high-strength steel and are likely to suffer from fatigue failures started by deep corrosion pits caused by oxygen, either from the mud itself or from being stacked wet. 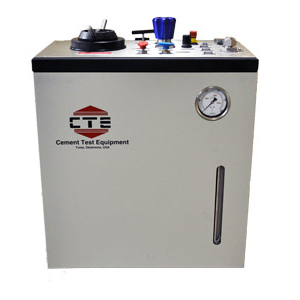 The CTE M10-400 is designed to simulate chemical corrosion experienced in petroleum production operations. Chemical corrosion typified by hydrogen sulfide, carbon dioxide, strong acids, concentrated brines, biological effects, erosion corrosion, sulfide stress corrosion, chloride stress, mud corrosion, etc. The type and amount of inhibitor used–inhibitor loadings–are determined by measuring the corrosion of samples of casing or tubing–coupons–in a corrosion apparatus.